Bollywood actors love for Football seems to have increased since the past few years. We see Indian film personalities quite often sharing pictures with Soccer players. 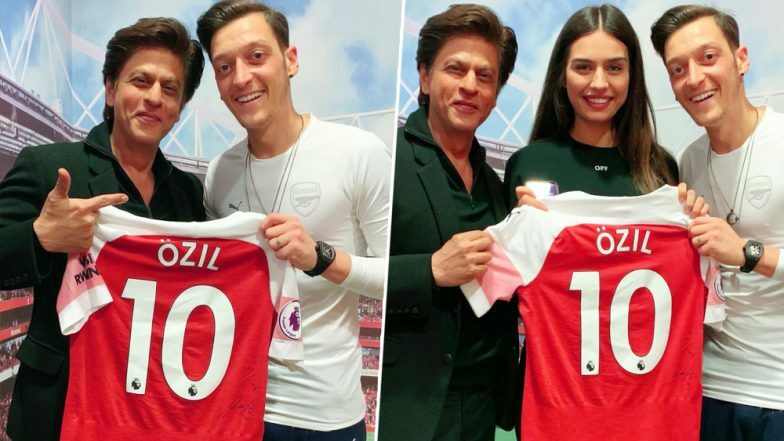 Famous Indian film star Shah Rukh Khan shared a picture on his social media account with Arsenal star Mesut Ozil and his fiance Amine Gulse. Shah Rukh Khan Fans Miffed With Sara Ali Khan for Referring Him As UNCLE, Twitterati Comes To Rescue. King Khan was overwhelmed by the hospitality he received on his visit to Arsenal club and congratulated Arsenal for their victory over Newcastle in the on-going English Premier League tournament. Arsenal now stands third in the point table with 63 points. Mesut Ozil is a German professional footballer, who plays for Premier League club Arsenal. Ozil mostly plays as an attacking midfielder. Arsenal Star Ozil is said to have engaged with Swedish-Turkish actress Amine Gulse in March, 2017. The couple might marry this year in July. Amine Gulse became Miss Turkey in the year 2014 and represented her country at the Miss World 2014 pageant. The King of Bollywood Shah Rukh Khan is also the co-owner of two times Indian Premier League winner Kolkata Knight Riders (KKR). Shahrukh recent release of his own production house Red Chillies Entertainment was Zero, which also starred Bollywood actors Anushka Sharma and Katrina Kaif. The upcoming movies of SRK are Dhoom 4 and Don 3.